Roulette, in all of its forms is really a very simple game to understand. 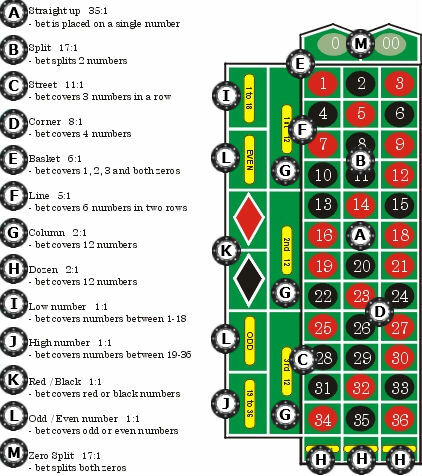 You have a wheel with 36 pockets numbered 1 to 36 and colored red or black, a further pocket (or 2) numbered zero, and an accompanying table layout with corresponding betting numbers and betting options. 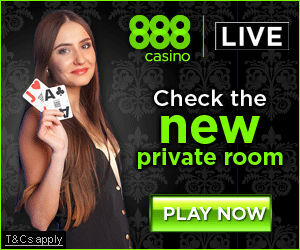 You select your bets by placing chips on the table up until the point where the dealer or croupier announces “no more bets” or “rien ne va plus”. The winning bets will be determined based on which pocket on the wheel the roulette ball comes to rest on. This number is marked on the table by the dealer using a dolly (or electronically in the case of live roulette). Bets are categorized as ‘inside bets’ and ‘outside bets’. Typically casino will set table limits in respect of both inside bets and outside bets. 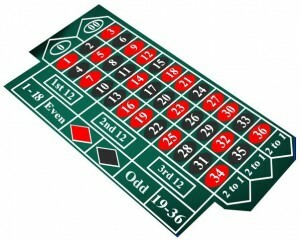 The layout of an American roulette table is the same as that of its European counterpart apart from one key difference – there’s a double zero (oo) in addition to the single zero (0). Of course this is also reflected by an additional zero being on the accompanying roulette wheel for the American version of the game. While this difference is a minor one from a presentation perspective, from a house edge or house advantage perspective it is a crucial one. Discussed further in our Return to player section, the additional zero makes for a slightly higher house edge by virtue of the fact that payouts remain the same while odds of hitting the right number are increased because there are 38 possible outcomes rather than 37. 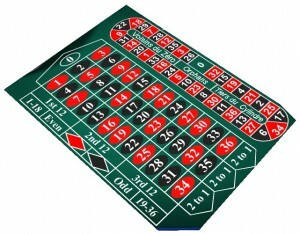 European Roulette has only a single zero on the table layout and accompanying wheel. While this may seem a minor difference from a presentation perspective, from a house edge or house advantage perspective it is crucial. While the payouts are the same for both European and American roulette, the odds of hitting your selection in this version of game are better given there are only 37 possible pockets for the ball to fall into. This is explored further in our Return to player section below. Don’t be too fussed with the different looking table, and French labeling. In most respects this is the same game as European Roulette…. 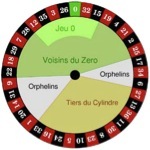 a single zero, an identical wheel and largely the same bets and payouts (albeit named in French of course) as European Roulette. One difference worth noting is the La Partage rule. La Partage dictates that you lose only half of your bet, not all of it, if you place even money (outside) bets and the ball lands on zero. Asian roulette is not as common at online casinos as its American or European counterpart, but there is at least one live platform that offers this version of the game so it’s worth a quick look. 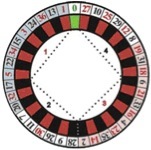 Asian roulette is similar in most respects to European roulette (same odds and single zero game) and its key point of difference is the number sequence on the wheel – as depicted below. From a return to player perspective Asian roulette, like European roulette offers superior returns to the American version of the game. This should be a crucial consideration for all roulette players and it turns to the question of how much money you are statistically likely to win for a given amount invested. A return to player rate of 95% indicates that for every $1,000 bet on a given game, the mathematically likely return is $950, or a $50 loss. This can also be expressed as a 5% house edge. Now the bad news is that every form of roulette, whether it be European, French, American or Asian, has an in built mathematical house edge, no mater which bet or combination of bets you choose to make. This is how casinos make their money. But a crucial point worth remembering is that this house edge differs from one form of the game to the next and this difference is brought about by the presence (or absence) of a second zero. Consider a straight up bet on both an American and European roulette table. In both cases you get a 35 to 1 payout for a hit but the odds of hitting your bet playing the American version are slightly worse than the European version because there are 38 possible outcomes rather than 37. This fact, and the resulting house edge and return to player (RTP) rates are presented in the below table. The clear message here: avoid American roulette and play European or Asian roulette if possible. 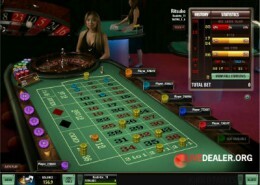 By far the most common version of roulette offered in live online format is European, however French and American variations are available. Use the gallery on the live roulette summary page to select the version you want to play. What you may also find playing live, is that the time period between spins can differ significantly from one casino to the next. As a general rule, the ‘for television’ games such as those offered at Supercasino take plenty of time between spins, while some of the other casinos can be notably faster. If its a very fast game you prefer, then Speed Roulette from Evolution Gaming or Playtech is probably a good option. The others generally sit somewhere in between. Also note that table limits differ significantly from one casino to the next. For a comparison of live roulette limits click here. No other casino game seems to have as many systems devised and advertised to help players win than roulette. Maybe this is because it is a reasonably simple game to understand, and the systems are typically easy to employ. Unfortunately many of the better known systems rely on a flawed logic that reasons that past spin results will impact future outcomes. Referred to sometimes as the ‘gambler’s fallacy’ this idea leaves rather large holes in the mathematical soundness of these systems, and means quite simply that they don’t work. Now where a method can be devised to bring about a player edge on individual spins this is a different story. Wheel bias analysis systems devised around a specific wheel’s tendency to drop balls in certain regions have enabled advantage players to win big – the most famous case of this was Billy Walter’s $3.8 million win at the Golden Nugget in Atlantic City in 1986 on a wheel his team found to have a slight drop bias. Needless to say the Golden Nugget, and casinos all around the world, were quick to invest in new low profile, precision technology wheels from specialists like John Huxley. Assuming a well engineered, unbiased wheel (as almost all now are) it must always be remembered that each spin of the roulette wheel is an independent event and the odds of winning or losing on that spin are in no way influenced by prior outcomes. Nevertheless, it is fun to to consider how these systems work and the thinking (albeit flawed) underlying them. One of the most commonly discussed and employed systems which forms the foundation of a bunch of variation systems, is the Martingale. The full mathematical analysis of this system is set out at Wiki. The system dictates that players, playing even money outside bets, continue doubling up until such time as a win occurs, at which point all losses are recovered and a profit equal to the original bet amount is made. Proponents of the system reason that statistically a loosing streak cannot last forever and consequently a sufficiently bankrolled player must eventually win. You can read about the Martingale and live roulette here, or roulette systems generally here. While roulette systems (especially most for sale on the internet!) should be take with a grain of salt, techniques have been devised over time that have allowed advantage players to beat certain wheels in certain casinos. Crucial for this to be possible is identification of a bias in the wheel itself or dealer’s ball spin that can then exploited.